keeping you in the know about your favourite bands. As some of you may know, I am always on the look out to discover new music. Last week, it was suggested I listen to indie rock, guitar driven trio Scarlett and Saffron – you can view their Soundcloud here. Consisting of Rob Boswell, Olly Croft and Louis Kershaw, they have played gigs up and down the country, and seem to have built up a large following of fans. 2 years ago the band uploaded Suffocate Me Softly Katy to their soundcloud, and now they’re back with a brand new EP, available to download from iTunes. 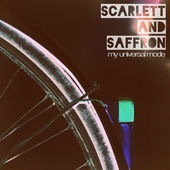 The bands EP ‘My Universal Mode’ consists of 3 fantastic tracks. Pushrod is an absolutely top quality song, with likeness to some of Catfish and the Bottlemens music. Not only is the song upbeat and full of great guitar sounds, but it is also the sort of song I could imagine singing back to this band at one of their gigs. Following on from Pushrod is 45, which unlike the first track, has a punchy start and no musical intro. It’s fast pace, vibrant energy, and melodic guitar riffs keep the listener interested and eager to hear more! The final track Marfinkla, starts off slower than the previous two, the tempo builds up as the track goes on. With top guitar and drum playing throughout, this tune definitely keeps up the brilliant reputation this band has already earned. If you have the opportunity, I would definitely recommend having a listen to this band. With their brand new single being released in March 2016, and their following only growing, this is sure to be a big year for Scarlett and Saffron. Why Sam Fender has changed the music scene! Big Thief, the best there is.